Neil Peart has penned a new article called "The Heart and Soul of a Drumset." 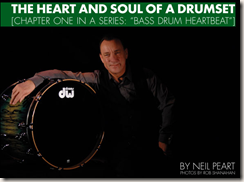 The first chapter "Bass Drum Heartbeat" is available on the DW website. In addition, there's a great video of Neil talking about the DW "X shell" and hybrid kit. In the video, there's a time-lapse sequence of Lorne Wheaton setting up the Snakes kit. Pay close attention to the song playing in the background.